Handmade stained glass kaleidoscope by Allison Borgschulte. 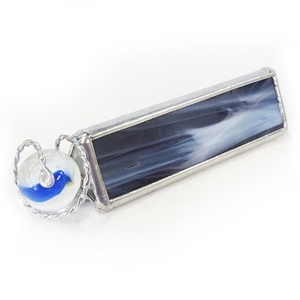 The outside casing is made with grape and white glass which is wispy in pattern. It contains an equilateral 3 mirror system which results in repeating triangle images reflecting outward to the edges of the viewing area. Comes with one 1" boulder marble which is interchangeable with other marbles from your collection that are approximately 1" in diameter. (The marble you receive may vary from what is pictured based on availability. The marble is held in the scope with a coiled wire, which flexes to accommodate marbles ranging in diameter from about 7/8" to 1 1/8". The kaleidoscope is 4" long(not including wire and marble). The sides of the scope are 1 1/8" in height. For more variations, consider purchasing a "boulder pak" or handmade 6 pack of marbles. While in the shopping cart, specify that you would like transparent styles for kaleidoscope.